Artist's impression of the ExoMars rover and surface platform on the surface of Mars. 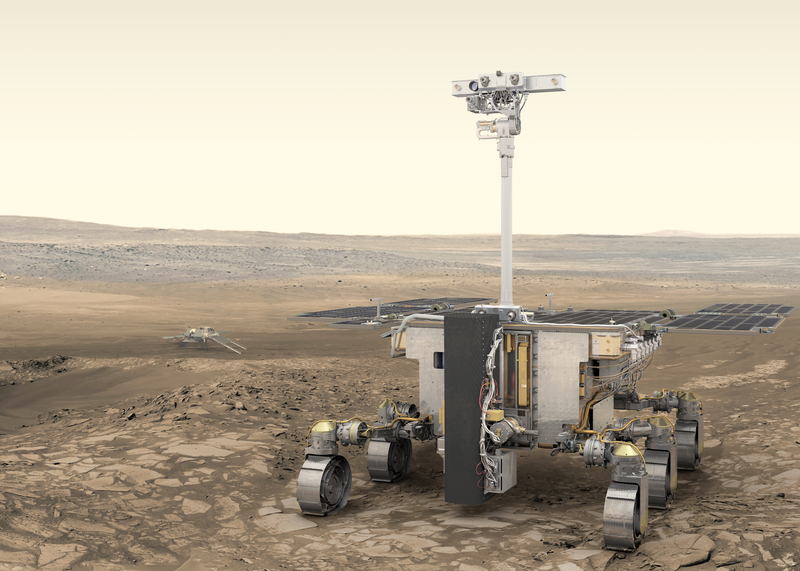 The 2020 mission of the ExoMars programme will deliver a European rover and a Russian surface platform to the surface of Mars. A Proton rocket will be used to launch the mission, which will arrive at Mars after a nine-month journey. The rover will travel across the martian surface to search for signs of life. It will collect samples with a drill and analyse them in its onboard laboratory. ExoMars 2020 will be the first mission to combine the capability to move across the surface and to study Mars at depth. The surface platform, which is the responsibility of Roscosmos and the Space Research Institute of Russian Academy of Sciences (IKI), will remain stationary and will investigate the surface environment at the landing site. The ExoMars Trace Gas Orbiter, part of the 2016 ExoMars mission, will support communications. ExoMars is a joint endeavour between ESA and Roscosmos, with important contribution from NASA.